I grew up in North Florida during the 1950s and 1960s before the state became as overdeveloped as it is now. At the time, there was a captive Florida Panther at a local animal museum that had been injured either by guns or automobiles and was there to recover. It was my favorite animal in the place, one that still lived in the wild in the Florida Panhandle. In my recent contemporary fantasy novel The Seeker, some of the action takes place at a wild, wonderful and somewhat forbidding tract of piney woods, swamps and wet prairies near the mouth of the Apalachicola River called “Tate’s Hell.” That name comes from the legendary man named Cebe Tate who chased a panther through the swamp because he thought it was killing his stock. He disappeared. I grew up with that legend–one that included a folk song about Tate by Florida singer Will McLean–and knew the area well. So naturally, I mentioned the legend in my novel which is set at a time when Panthers were still there. Catching up on the status of the Panther as I wrote the novel was a sad experience. While I was pleased to hear that in addition to the Nature Conservancy, organizations like Panther Net and Friends of the Florida Panther Refuge were working hard to protect the panther and its vanishing habitat, I was saddened to see how much ground and how many panthers had been lost since the says when I hiked in Tate’s Hell. One conservation push in many areas of the country is wildlife corridors, protected strips or chunks of land that link up with vital habitats, creating a way for animals to travel between them. In some places, you will see green-space overpasses and underpasses routing animals past Interstate highways. Last year, the Nature Conservancy was able to protect a 1,278 acre tract in Glades County, Florida that Panthers in protected areas can use to increase the size of their range near Naples, FL. According to the Nature Conservancy, “This acquisition will encourage the natural recovery of the Florida panther population by providing habitat where animals can den and stalk prey, and migrate from southern Florida to areas north of the river. Other species will benefit as well.” The range for a male panther is 200 square miles. The range for a female panther is a 75-mile block within the male’s territory. 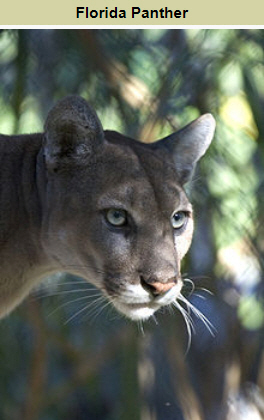 I hope the efforts of hard-working people to save the Florida Panther will succeed. In a tourist and development-minded state, playgrounds often trump wild places and vital habitats in the eyes of government, Chambers of Commerce and the public. Too bad. It’s a short-sighted view of one’s world. I sure hope the panther can be saved. There’s something extra special about those big cats. Same with the Arizona jaguar. One has been spotted there recently by a “critter cam”. Those critter cams are handy. I like the big cats and hope we can find a way to co-exist with them. I wish we could but have little hope. Did you know that despite the fact that there are only 250 – 300 wolverines in the lower 48 states, there is still a trapping season for them in Montana? As long as the states have that kind of attitude toward the state of the Earth, there is little hope. The states so often cave in to local groups who are vocal while the rest of the population either doesn’t know what’s going in or yawns when they hear about the issue. The Florida panther is such a magnificent creature, and unfortunately, like mountain lions of the West, much maligned. I too hope it isn’t too late to save this beauty. Humans are so short-sighted. Yes, the mountain lions, too. And now, yet again, wolves are under attack.